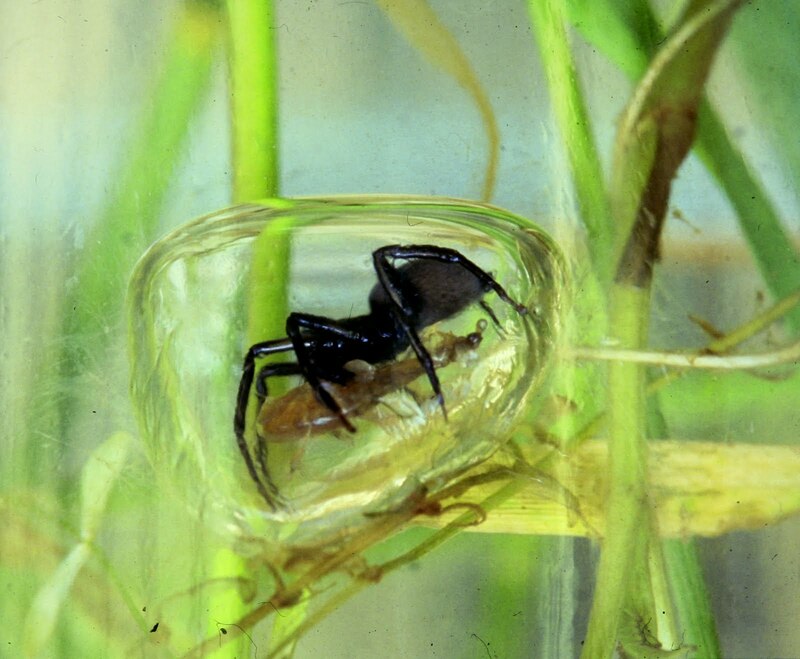 The diving bell spider or water spider (Argyroneta aquatica) is one of the few species of spider known to live almost entirely under water. It is the only member of the genus Argyroneta. When out of the water, the spider ranges in colour from mid to dark brown, although the hairs on the abdomen give it a dark grey, velvet-like appearance. A. aquatica is able to remain submerged for prolonged periods of time due to the silk-based structure it constructs in order to retain an oxygen supply, named after the diving bell structure it resembles. The species range in size, although the size of females may be limited as they put more energy into building and maintaining their larger bells. Males are typically more active and 30% larger than females. This size differential favoring males is unusual for spiders, where sexual dimorphism is usually in favour of larger females. Theories suggest that the male’s more active hunting style requires greater strength to overcome water resistance and counteract the buoyancy of their mobile air supplies. This larger body size is also associated with longer front legs, shown to affect diving ability and giving the males superiority in diving over the more sessile females. The spiders prey on aquatic insects and crustaceans such as mosquito larvae and Daphnia. Their bite is quite painful as the fangs can pierce the skin, causing localised inflammation and feverishness. The spiders themselves fall prey to frogs and fish. If you are up for a creepy video of the diving bell spider, watch it here on Smithsonian website. You can also read more on Wikipedia.